How many technicians does it take to change the light bulb at the top of a three-hundred foot tower? Probably just one if it’s Jon Johnson. 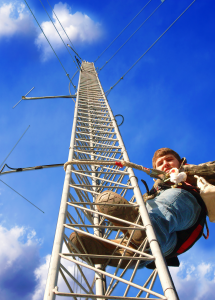 He climbs towers—radio, TV, communication— for Shipman Communications of Denison, the company that keeps police and fire departments all over Texoma talking to each other. We see those fla shing lights on top of some towers. I suppose they need changing from time to time? Yes, it still takes a person to change the lights on the towers. They are actual bulbs, halogen and strobe. The size of the bulb depends on the type of tower and the FAA’s (Federal Aviation Administration) regulations on the type of safety lighting required. We work in a lot of different areas. We maintain and service 9-1-1 dispatch vehicles, climb towers, you know, a little bit of everything. We also do a lot of private and industrial communications. However, 75 to 80 percent of our business is public safety communications for the sheriff’s office and EMS and fire departments. We service about six counties in north Texas and twelve counties in southeastern and central Oklahoma. What got you on a tower the first time? I just came by Shipman one day and asked if they needed part-time help, and I’ve been here a little over three years. I just kind of did it one day and thought it was really cool, but you just have to get over the fear of climbing straight up into the air and really trust yourself. 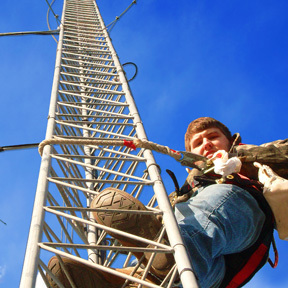 The first tower I climbed was 140 feet tall, and I went up to hang an eighteen-foot antenna. We have customers that look at us and say, “Well, I’m happy you’re here to do it, ‘cause I’m not going to do it.” It’s a job that you really have to want to do and enjoy doing. Some people look at a tower and say, “Yeah I can do it,” and do it, or just say “No” and walk away. There really isn’t an in between. How difficult is it to climb the towers, and how dangerous? It’s really a whole-body workout. I mean it’s a Stair-Stepper from hell. You work your calves, arms, thighs, I mean everything. You’re climbing completely vertical, lifting your own body weight. If you put on thirty pounds of safety equipment, plus the weight of the tools, and the different parts you have to carry, it may add two hundred extra pounds slung all over your body. So yeah, we get our workout. Sometimes we work in tandem, other times we don’t. It depends on what you think you’re capable of. However, there is always someone on the ground watching your back. If I get tangled up in my lines, they will climb up the tower and give me a hand. How important is the safety factor? We do a lot of safety courses, which teach you fall protection and how to tie off your climbing lines. We learn the importance of having a breakaway line, which is a bundled line you hook up above your head as you climb. If you fall, the breakaway line reels off with you and absorbs the shock of the impact. We really strive to be safe. We inspect and replace our equipment regularly. We look for fraying in the climbing ropes. The first sign of fraying shows that it needs replacement. Our harnesses have a “life expectancy.” If I were to buy a new harness today, I’m not supposed to use it for longer than a year. Even if I only climbed three times in it and it still looks brand new, I’m not supposed to use it. We keep up with all of our safety equipment because it can be a life or death situation. Up there in the air, what strange things have you seen or had happen? There are times when you will start in the morning and its beautiful, but three or four hours will pass by and huge storm will roll up on you. I’ve been on towers larger than three hundred feet and the wind will be calmly blowing, and then suddenly there’ll be large gusts, and you can feel the tower try to swing and buck you. You really have to trust your safety equipment more than you trust yourself when that happens. The oddest thing that I’ve seen, which you wouldn’t really think could happen, is that wasps actually build nests nine hundred to thirteen hundred feet up on a tower. I’ve been six to eight hundred feet on a tower and been attacked by wasps.